east side bride: The YAYs have it. YAY! votes for the Carrie Dip-Dye went from 62% early yesterday down to 54% this morning. I blame all the tampon comments for the dip in votes. For the record, I'm not a big fan of the dress. Wai-Ching is just too Burning Man for my taste. On a happier note: Ryan Gosling won the impromptu Is Ryan Gosling Cuter than a puppy? 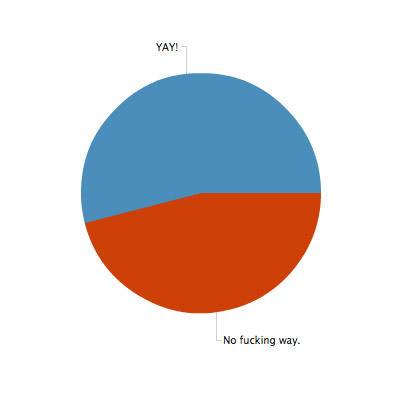 twitter poll with 100% of the vote. On the plus side, at least now we know where to find a dress for that Hunger Games-themed wedding. Ugh, dress is awful. I hate disagreeing with Rob. Rob's taste is all over the map. @ESB, it is a gorgeous map. @Hillary, I hate always being right. I hear you ran into Max! Rob: I, too, think that I am always right. This dress proves at least one of us wrong. I don't think it's me. I met Max Memorial Day weekend up at Camp Wandawega. Saw him again a few weeks ago and he's coming to dinner at my place on Sunday. His girlfriend can't come so we are an odd number if you want to drive up and fill the 8th seat. @Hillary, now you're wrong twice. Look on the bright side, that probably fills your quota for the year. Thank you for the invitation. However, I must decline due to prior engagements. Have a wonderful time! @Rob YOU'RE A BOT, AREN'T YOU? i voted against the dress but am totally for this picture of it. she looks like she was taken against her will to evil dead: the musical.